An Indian wedding has a bunch of rituals pre-wedding and post-wedding day. Mehndi, Sangeet, Haldi, Wedding and Bidai, all these ceremonies include in any big fat Indian wedding. When we talk about Indian Weddings the first thing comes on our mind is dancing and singing. Each ceremony has its own type of songs. Not only in the Sangeet ceremony but also in Haldi, Mehndi and in Bidaai as well there are a bunch of songs that play during the rituals. Bidaai is one of the saddest moments in any wedding when the bride leaves her house, her family and parents and walks into her new life with a whole new family. India has a extensive types of communities in which there are different types of songs are being played or sung during the rituals. But thanks to Hindi Film Industry that gives us so many Bidaai songs that we can play at any Indian wedding. Here in this article I will list up 10 hit and heart touching Bidaai songs from different Hindi Movies. The song was from one of the biggest hit movies during 90s. The movie hum aapke hai koun has this song whihc is perfect for the Bidaai ritual. The lyrics of the song say that the bride will follow her father’s words in her new home and accept everyone as her own family. Released in late 90s, the movie aise bhi kya jaldi hai has this awesome Bidaai song. It is a duet song for a daughter and a father. The lyrics say the daughter is complaining why she grew up that now she has to leave her parents and home and the father recalls her childhood. Baba ki rani is another hit song apt for the Bidaai. The movie was released in early 20s and the song immediately became popular in Indian weddings. The Priyanshu starrer movie aapko pehle bhi kahin dekha hai has this beautiful song. Released in early 20s, comedy movie mere baap pehle aap has this song in it. The Akshay Khanna – Paresh Rawal starrer movie was based on a son who wants his father to get married first. This song is the all time favourite Bidaai song that was used in several events and other movies. The song was originally released in late 60s. The Raj Kumar starrer movie Neel Kamal has this beautiful song. It still makes your heart cry when you listen to the song. 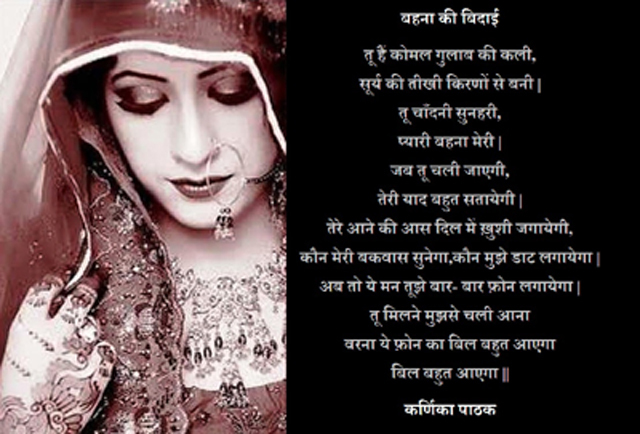 This is another amazing piece of song that is apt for Bidaai. The song was released in late 60s but continues to entertain people. The song was used in several movies and television shows. The song was a super hit when it was out in late 70s. The movie also had some other songs which also made a good note in music industry. Not only in weddings but also in different events and TV show you will get to hear the song. Released in early 80s, the song was from a movie starrer Rishi Kapoor. The song and the movie was a big hit then. It still plays in weddings and in several other movies. The song was released in late 50s. Though the song and the movie was so old, but it still makes people feel sad. The song is appropriate for Bidaai occasion. Released in early 70s, the song O babul pyaare got immense popularity. It was from a big hit movie then starrer Hema Malini and Dev Anand. The song is still loved by people.